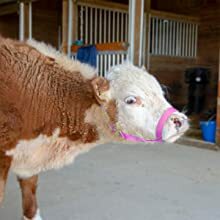 DURABLE - These halters are made with a high-quality nickel hardware and are built to last, with sturdy connections and buckles. This is a halter that's built strong and made to last and look attractive for many years. 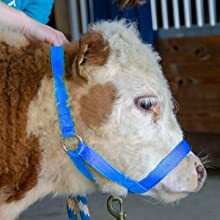 CLASSIC DESIGN - These halters feature a traditional crossed under-the-chin design that is perfect for cattle and other livestock, or even for miniature horses. ADJUSTABLE FIT - These halters have an adjustable crown strap. Each of these halters is highly adjustable but can also be made larger or smaller through the addition of more holes to the crown strap. NEW SIZING – you let us know our sizes were off and we listened, so now as of May 2018 our smaller halter sizing has been fixed and is now more correct so that you can buy with confidence. MULTIPLE COLORS – our cattle halters are available in five attractive Colors: Black, Royal Blue, Lime Green, Red, and Pink so that you can choose the color that best complements your cow! 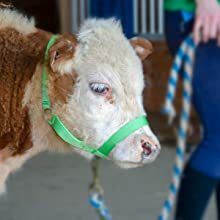 No matter what breed or type of cow you have, Derby has a nylon halter designed to fit them! With four sizes and five attractive color options, you're sure to find the perfect fit and style for your cow. 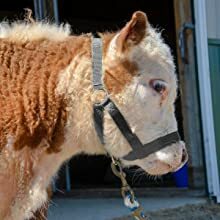 These halters are a great all purpose halter: affordable, high quality, and perfect for the barn or pasture. They're built with sturdy double nylon, have reinforced stitching, and durable nickel hardware. This is a halter that's built strong and made to last and look attractive for many years. Our halters are available in Royal Blue, which is one of our top sellers and customer favorites. If you want a great, colorful, easy to spot springtime color, check out our Lime Green halters! Our top selling color: classic, stylish, and beautiful, Black makes any animal look better! We offer both Pink and Red (not shown) halters too, for those who want a warmer halter color.